If you’re familiar with NetFlix’s Stranger Things, then you’ll feel immediately at home with Inbetween. This small box game from Polish publisher Board&Dice is a strictly two player experience that revolves around the epic tug-of-war between light and darkness. One player defends humanity, whilst the other, well, the other attempts to drag it under. Inbetween is a card driven game that plays in under an hour and offers a fair level of variability, making it an ideal travel companion for players that enjoy direct interaction and thwarting each others plans. Inbetween is the classic game of good versus evil, albeit with a modern twist that obviously comes from popular fiction. Whilst not officially licensed as a Stranger Things tie in, there is absolutely no doubt about where Inbetween designer Adam Kwapinski (also responsible for the ridiculously good Lords of Hellas) drew his inspiration from. Players vie for control of ten citizens, each of which will be drawn randomly and placed in a loose circle at the beginning of the game. Half of the citizens will be placed face up, whilst the other half will be placed face down. All cards are double sided, with each one showing a blue “human” side and a reddish “creature” side, each of which will be the same character, but in either a comfortable or precarious position respectively. Each card will feature a status track and at least one symbol that holds influence over it, as well as a written ability that will trigger on certain occasions. Inbetween is strictly a two player game and each player will be dealt a hand of five cards from their own personal deck. They’ll also have a number of energy cubes and a track that charts their overall level of awareness, which ranges from zero to six. Each level of additional awareness comes with a powerful ability and players may only use one of these special abilities once during the entire game, so choosing when to do so is a key strategy. More importantly, if a player should reach maximum awareness, they win immediately. The awareness track is affected by several things, including when players either secure (for the good player) or devour (for the bad player) the townsfolk, or as the result of the text written on a card itself. The game also ends when one player either secures (or devours) three townsfolk. To exert influence on a character, players must play cards from their hand that have matching symbols to those that influence the townsfolk, with cubes used to track the current position. A wooden cylinder moves from character to character each turn, resulting in the written abilities on them being triggered if the character is being influenced. Any character with no cubes on them is said to be in between the realms and their ability will not trigger. Inbetween is one of many Board&Dice games that come packaged in tiny, fun-filled boxes that could easily lead you to overlook them. At a purely component level, that would be a mistake, at least where Inbetween is concerned. The box has no words on either the front or back, with just an innocuous logo on the side panel to indicate what game you’re looking at. On the front, the box depicts a stylish and attractive scene of small town america, complete with white picket fence and station wagon On the back, however, you’ll find the same scene, albeit twisted in a sort of Cthulhuian style. Inside the box, the character cards accurately depict the same kind of small town sheriffs, nurses, store owners and innocent bystanders that brought such a human angle to Stranger Things. The human side of each card generally shows those people behaving normally in their jobs or home lives, whilst the creature side has them clutching their faces and rocking in despair, or running from an unseen menace. Combine the look of those character cards with the matching player decks and Inbetween is a game that oozes theme. It’s not strictly a pleasant experience when playing as the creature (and I wish there was a solo or cooperative mode) but the components will leave you in absolutely no doubt about what you need to do. The other pieces include wooden tokens and cubes as well as a small, straightforward manual All said, Inbetween is a very nice little package that I think is better for having been compressed into such a small form factor. Turns of Inbetween are very fast and relatively straightforward, with four phases to work through. The first of these is skipped all but once per player (usually) and is called The Awareness Phase. During this part of the turn, the active player may choose to use the ability associated with their current level of awareness, but assuming they don’t, the Action Phase (which is where most of the gameplay will take place) happens. For their action, the current player must choose one action from the three available to them. After taking their action, the player must progress the activity phase. If the turn cylinder is currently sitting on a citizen that is not under at least two points of control of either player, then nothing happens. However, if a player has control of the character, then the text written on that character card (usually good for the player who has control) will be activated. It’s also possible to move your awareness track (if the character is currently secured) in exchange for paying an equivalent amount of energy. The final phase (movement) then simply involves taking the turn cylinder, flipping it, and moving it to the next character based on a direction token that can flip between clockwise and counter-clockwise. As is often the case, there are two key areas to consider when thinking about how Inbetween feels to play. Firstly, as a fan of both Stranger Things and any fiction that explores links between the human realm and what might lie beyond it, I can’t fault Inbetween thematically. Despite its small box and lack of any elaborate components (boards, miniatures etc) it creates a wholly encompassing ethos that is very immersive when the ring of cards is laid out and the decks are in hand. Mechanically, Inbetween is very simple, but it’s also rather quick, quite unusual and fairly varied from one playthrough to the next, which means that it fits nicely into the “medium weight travelling companion” kind of bracket. There is some luck involved from one game to the next because the cards can be dealt favourably, but it’s the kind of luck that I see as entirely even handed — for example you’d need to be really unlucky to receive a hand of cards that feel useless, whilst your opponent receives one that feel both perfect for the board and the position of the starting token. The prepare ability allows players to combat this fairly quickly anyway. Despite being straightforward, Inbetween has a number of points that make it strategically interesting. Deciding when to advance your own plans rather than hamper your opponent’s one is a key one, but manipulating the board state to reach situations where you can do both at once is the nirvana. As each game of Inbetween draws closer to the end, you’ll usually notice that at least two of the potential win conditions are close to being fulfilled and on average, the game remains tight and competitive up to the very end. Inbetween is one of a growing number of games that offer thematic and mechanically satisfying experiences in a small box form, without compromising on quality when it comes to board presence, component quality or in any other way. 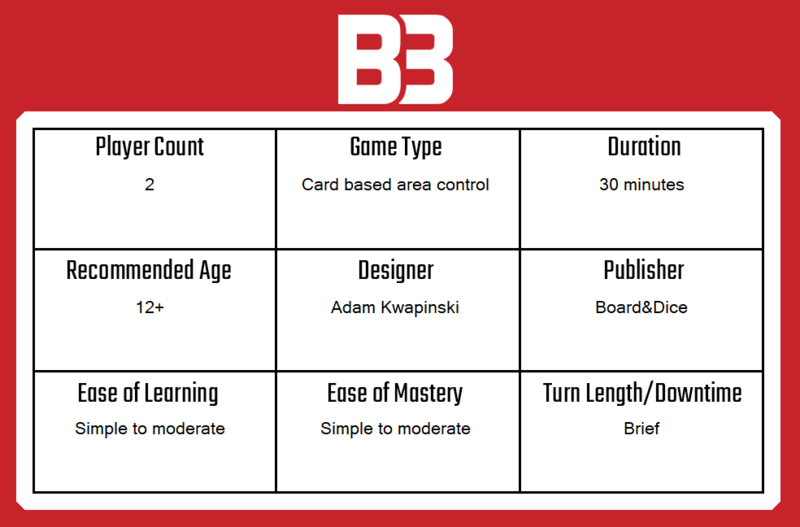 Yes, Inbetween supports just two players, but it is reasonably varied from one game to another in terms of setup, but the strategy of selecting and using cards whilst attempting to manage resources allows for multiple playthroughs in a single session. You certainly don’t need to be a Stranger Things fan to make the most of Inbetween, although I do think that the ethos it depicts is very, very well aligned to that of the Netflix series. From the 80’s inspired characters to the simple fact that it’s a game about humans trapped between two realms, the links are clear and present throughout. On the slight downside, someone does need to play as the creature which I suppose is a bit marmite. I never minded, but I did play with a few people who indicated a strong preference to play as the human side, on the basis that acting in an overtly evil way wasn’t something that appealed to them. In between (pun intended) the excellent component quality and that superb artwork, the mechanical quality and strategic depth and the theme (which I’ll admit, I am a big fan of,) Inbetween is a success. It’s a tight, exciting game that delivers fast, relatively decision heavy gameplay with some interesting twists and turns to the norm. For players who love thematic games that work because of their component design rather than due to a scripted outcome, Inbetween is a strong recommendation. A copy of Inbetween was provided for review purposes. You can find out more about it on the website of publisher Board&Dice.